Proprietary Name: Oxybutynin Chloride What is the Proprietary Name? Non-Proprietary Name: Oxybutynin Chloride What is the Non-Proprietary Name? Oxybutynin Chloride with NDC 27241-156 is a a human prescription drug product labeled by Ajanta Pharma Limited. The generic name of Oxybutynin Chloride is oxybutynin chloride. The product's dosage form is tablet, extended release and is administered via oral form. FDA Application Number: ANDA211655 What is the FDA Application Number? Oxybutynin chloride is a muscarinic antagonist indicated for the treatment of overactive bladder with symptoms of urge urinary incontinence, urgency, and frequency.Oxybutynin chloride extended-release tablets is also indicated for the treatment of pediatric patients aged 6 years and older with symptoms of detrusor overactivity associated with a neurological condition (e.g., spina bifida). The recommended starting dose of oxybutynin chloride extended-release tablets is 5 mg or 10 mg once daily at approximately the same time each day. Dosage may be adjusted in 5-mg increments to achieve a balance of efficacy and tolerability (up to a maximum of 30 mg/day). In general, dosage adjustment may proceed at approximately weekly intervals. Oxybutynin chloride extended-release tablets, USP are available as 5 mg, 10 mg and 15 mg tablets for oral use:5 mg: Light yellow to yellow colored, round, enteric coated tablets with “0B1” imprinted on one side with black ink.10 mg: Light pink to pink colored, round, enteric coated tablets with “0B2” imprinted on one side with black ink.15 mg: Light grey to grey colored, round, enteric coated tablets with “0B3” imprinted on one side with black ink. Oxybutynin chloride extended-release tablets are contraindicated in patients with urinary retention, gastric retention and other severe decreased gastrointestinal motility conditions, uncontrolled narrow-angle glaucoma.Oxybutynin chloride extended-release tablets are also contraindicated in patients who have demonstrated hypersensitivity to the drug substance or other components of the product. There have been reports of hypersensitivity reactions, including anaphylaxis and angioedema. Oxybutynin is associated with anticholinergic central nervous system (CNS) effects [see Adverse Reactions (6)]. A variety of CNS anticholinergic effects have been reported, including hallucinations, agitation, confusion and somnolence. Patients should be monitored for signs of anticholinergic CNS effects, particularly in the first few months after beginning treatment or increasing the dose. Advise patients not to drive or operate heavy machinery until they know how oxybutynin chloride extended-release tablets affects them. If a patient experiences anticholinergic CNS effects, dose reduction or drug discontinuation should be considered.Oxybutynin chloride extended-release tablets should be used with caution in patients with preexisting dementia treated with cholinesterase inhibitors due to the risk of aggravation of symptoms.Oxybutynin chloride extended-release tablets should be used with caution in patients with Parkinson’s disease due to the risk of aggravation of symptoms. Oxybutynin chloride extended-release tablets should be used with caution in patients with myasthenia gravis due to the risk of aggravation of symptoms. Oxybutynin chloride extended-release tablets should be used with caution in patients with autonomic neuropathy due to the risk of aggravation of symptoms of decreased gastrointestinal motility. Oxybutynin chloride extended-release tablets should be administered with caution to patients with clinically significant bladder outflow obstruction because of the risk of urinary retention [see Contraindications (4)]. Oxybutynin chloride extended-release tablets should be administered with caution to patients with gastrointestinal obstructive disorders because of the risk of gastric retention [see Contraindications (4)].Oxybutynin chloride extended-release tablets, like other anticholinergic drugs, may decrease gastrointestinal motility and should be used with caution in patients with conditions such as ulcerative colitis and intestinal atony.Oxybutynin chloride extended-release tablets should be used with caution in patients who have gastroesophageal reflux and/or who are concurrently taking drugs (such as bisphosphonates) that can cause or exacerbate esophagitis.As with any other nondeformable material, caution should be used when administering oxybutynin chloride extended-release tablets to patients with preexisting severe gastrointestinal narrowing (pathologic or iatrogenic). There have been rare reports of obstructive symptoms in patients with known strictures in association with the ingestion of other drugs in nondeformable controlled-release formulations. Because clinical trials are conducted under widely varying conditions, the adverse reaction rates observed in the clinical trials of a drug cannot be directly compared to rates in the clinical trials of another drug and may not reflect the rates observed in clinical practice.The safety and efficacy of oxybutynin chloride extended-release tablets (5 mg/day to 30 mg/day) was evaluated in 774 adult subjects who participated in five double-blind, controlled clinical trials. In four of the five studies, oxybutynin chloride tablets (5 mg/day to 20 mg/day in 199 subjects) was an active comparator. Adverse reactions reported by greater than or equal to 1% of subjects are shown in Table 1.Table 1: Adverse Drug Reactions Reported by greater than or equal to 1% of Oxybutynin Chloride Extended-Release Tablets-treated Adult Subjects in Five Double-blind, Controlled Clinical Trials of Oxybutynin Chloride Extended-Release Tablets.System/Organ Class Preferred TermOxybutynin Chloride Extended-Release Tablets5 to 30 mg/day n=774 %Oxybutynin Chloride Tablets1 5 to 20 mg/day n=199%Psychiatric DisordersInsomnia3.05.5Nervous System DisordersHeadache7.58.0Somnolence5.614.1Dizziness5.016.6Dysgeusia1.61.5Eye DisordersVision blurred4.39.6Dry eye3.12.5Respiratory, Thoracic and Mediastinal DisordersCough1.93.0Oropharyngeal pain1.91.5Dry throat1.72.5Nasal dryness1.74.5Gastrointestinal DisordersDry mouth34.972.4Constipation8.715.1Diarrhea7.96.5Dyspepsia4.56.0Nausea4.511.6Abdominal pain1.62.0Vomiting1.31.5Flatulence1.22.5Gastro-esophageal reflux disease1.00.5Skin and Subcutaneous Tissue DisordersDry skin1.82.5Pruritus1.31.5Renal and Urinary DisordersDysuria1.92.0Urinary hesitation1.98.5Urinary retention1.23.0General Disorders and Administration Site ConditionsFatigue2.63.0InvestigationsResidual urine volume22.33.51 Immediate-release formulation2 The bundled term residual urine volume consists of the preferred terms residual urine volume and residual urine volume increased.The discontinuation rate due to adverse reactions was 4.4% with oxybutynin chloride extended-release tablets compared to 0% with oxybutynin chloride tablets. The most frequent adverse reaction causing discontinuation of study medication was dry mouth (0.7%).The following adverse reactions were reported by less than 1% of oxybutynin chloride extended-release tablets-treated patients and at a higher incidence than placebo in clinical trials: Metabolism and Nutrition Disorders: anorexia, fluid retention; Vascular disorders: hot flush; Respiratory, thoracic and mediastinal disorders: dysphonia; Gastrointestinal Disorders: dysphagia,frequent bowel movements; General disorders and administration site conditions: chest discomfort, thirst. The following additional adverse reactions have been reported from worldwide postmarketing experience with oxybutynin chloride extended-release tablets. Because postmarketing reactions are reported voluntarily from a population of uncertain size, it is not always possible to reliably estimate their frequency or establish a causal relationship to drug exposure.Infections and Infestations: Urinary tract infection; Psychiatric Disorders: psychotic disorder, agitation, confusional state, hallucinations, memory impairment, abnormal behavior; Nervous System Disorders: convulsions; Eye Disorders: glaucoma; Respiratory, Thoracic and Mediastinal Disorders: nasal congestion; Cardiac Disorders: arrhythmia, tachycardia, palpitations; QT interval prolongation;Vascular Disorders: flushing, hypertension; Skin and Subcutaneous Tissue Disorders: rash; Renal and Urinary Disorders: impotence; General Disorders and Administration Site Conditions: hypersensitivity reactions, including angioedema with airway obstruction, urticaria, and face edema; anaphylactic reactions requiring hospitalization for emergency treatment; Injury, poisoning and procedural complications: fall.Additional adverse events reported with some other oxybutynin chloride formulations include: cycloplegia, mydriasis, and suppression of lactation. The concomitant use of oxybutynin with other anticholinergic drugs or with other agents which produce dry mouth, constipation, somnolence (drowsiness), and/or other anticholinergic-like effects may increase the frequency and/or severity of such effects.Anticholinergic agents may potentially alter the absorption of some concomitantly administered drugs due to anticholinergic effects on gastrointestinal motility. This may be of concern for drugs with a narrow therapeutic index. Anticholinergic agents may also antagonize the effects of prokinetic agents, such as metoclopramide.Mean oxybutynin chloride plasma concentrations were approximately 2 fold higher when oxybutynin chloride extended-release tablets was administered with ketoconazole, a potent CYP3A4 inhibitor. Other inhibitors of the cytochrome P450 3A4 enzyme system, such as antimycotic agents (e.g., itraconazole and miconazole) or macrolide antibiotics (e.g., erythromycin and clarithromycin), may alter oxybutynin mean pharmacokinetic parameters (i.e., Cmax and AUC). The clinical relevance of such potential interactions is not known. Caution should be used when such drugs are co-administered. Pregnancy Category B. There are no adequate and well-controlled studies using oxybutynin chloride extended-release tablets in pregnant women. Oxybutynin chloride extended-release tablets should be used during pregnancy only if the potential benefit to the patient outweighs the risk to the patient and fetus. Women who become pregnant during oxybutynin chloride extended-release tablets treatment are encouraged to contact their physician.Risk SummaryBased on animal data, oxybutynin is predicted to have a low probability of increasing the risk of adverse developmental effects above background risk.Animal DataReproduction studies with oxybutynin chloride in the mouse, rat, hamster, and rabbit showed no evidence of impaired fertility or harm to the animal fetus. It is not known whether oxybutynin is excreted in human milk. Because many drugs are excreted in human milk, caution should be exercised when oxybutynin chloride extended-release tablets are administered to a nursing woman. The safety and efficacy of oxybutynin chloride extended-release tablets were studied in 60 children in a 24-week, open-label, non-randomized trial. Patients were aged 6-15 years, all had symptoms of detrusor overactivity in association with a neurological condition (e.g., spina bifida), all used clean intermittent catheterization, and all were current users of oxybutynin chloride. 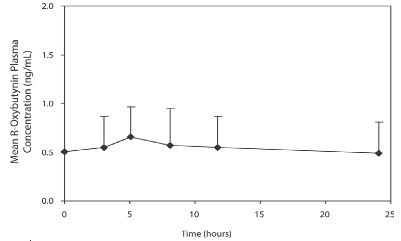 Study results demonstrated that administration of oxybutynin chloride extended-release tablets 5 mg/day to 20 mg/day was associated with an increase from baseline in mean urine volume per catheterization from 108 mL to 136 mL, an increase from baseline in mean urine volume after morning awakening from 148 mL to 189 mL, and an increase from baseline in the mean percentage of catheterizations without a leaking episode from 34% to 51%.Urodynamic results were consistent with clinical results. 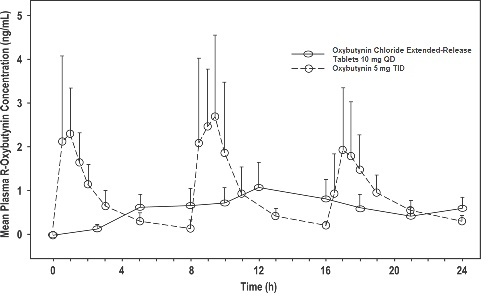 Administration of oxybutynin chloride extended-release tablets resulted in an increase from baseline in mean maximum cystometric capacity from 185 mL to 254 mL, a decrease from baseline in mean detrusor pressure at maximum cystometric capacity from 44 cm H2O to 33 cm H2O, and a reduction in the percentage of patients demonstrating uninhibited detrusor contractions (of at least 15 cm H2O) from 60% to 28%.The pharmacokinetics of oxybutynin chloride extended-release tablets in these patients were consistent with those reported for adults [see Clinical Pharmacology (12.3)].Oxybutynin chloride extended-release tablets are not recommended in pediatric patients who cannot swallow the tablet whole without chewing, dividing, or crushing, or in children under the age of 6. The rate and severity of anticholinergic effects reported by patients less than 65 years old and those 65 years and older were similar. The pharmacokinetics of oxybutynin chloride extended-release tablets were similar in all patients studied (up to 78 years of age). There were no studies conducted with oxybutynin chloride extended-release tablets in patients with renal impairment. There were no studies conducted with oxybutynin chloride extended-release tablets in patients with hepatic impairment. The continuous release of oxybutynin from oxybutynin chloride extended-release tablets should be considered in the treatment of overdosage. Patients should be monitored for at least 24 hours. Treatment should be symptomatic and supportive. A cathartic may be administered.Overdosage with oxybutynin chloride has been associated with anticholinergic effects including central nervous system excitation, flushing, fever, dehydration, cardiac arrhythmia, vomiting, and urinary retention.Ingestion of 100 mg oxybutynin chloride in association with alcohol has been reported in a 13-year-old boy who experienced memory loss, and a 34-year-old woman who developed stupor, followed by disorientation and agitation on awakening, dilated pupils, dry skin, cardiac arrhythmia, and retention of urine. Both patients fully recovered with symptomatic treatment. Oxybutynin chloride, USP is an antispasmodic, muscarinic antagonist. Each oxybutynin chloride extended-release tablet, USP contains 5 mg, 10 mg, or 15 mg of oxybutynin chloride USP, formulated as a once-a-day controlled-release tablet for oral administration. Oxybutynin chloride, USP is administered as a racemate of R- and S-enantiomers.Chemically, oxybutynin chloride, USP is 4(diethylamino-but-2-ynyl (RS) 2-cyclohexyl-2-hydroxy 2 phenyl acetate hydrochloride. The molecular formula of oxybutynin chloride, USP is C22H31NO3•HCl.Its structural formula is:Oxybutynin chloride, USP is a white crystalline powder with a molecular weight of 393.95. It is freely soluble in water and in alcohol, very soluble in methanol and in chloroform, soluble in acetone, slightly soluble in ether, very slightly soluble in hexane. Oxybutynin chloride extended-release tablets, USP also contains the following inert ingredients: anhydrous dibasic calcium phosphate, povidone, hypromellose, colloidal silicon dioxide, magnesium stearate, polyethylene glycol, methacrylic acid copolymer type c, talc, titanium dioxide, triethyl citrate, sodium bicarbonate, sodium lauryl sulfate, ferrosoferric oxide, ferric oxide red (in 10 mg only) and iron oxide yellow (in 5 mg and 15 mg only).The imprinting material contains: shellac glaze, black iron oxide, propylene glycol and ammonium hydroxide.Meets USP Dissolution Test 2.System Components and PerformanceOxybutynin chloride extended-release tablets, USP are formulated to deliver oxybutynin chloride at a controlled rate over approximately 24 hours. The dosage form is comprised of a hydrophilic cellulose polymer matrix tablet surrounded by an enteric coating system. The enteric coat is insoluble in the low pH environment of the stomach. As the tablet passes through the stomach and enters the higher pH environment of the small intestine, the enteric coating dissolves and/or erodes to expose the polymer matrix tablet which swells and releases drug at a controlled rate via diffusion and/or erosion. Oxybutynin relaxes bladder smooth muscle. Oxybutynin chloride exerts a direct antispasmodic effect on smooth muscle and inhibits the muscarinic action of acetylcholine on smooth muscle. No blocking effects occur at skeletal neuromuscular junctions or autonomic ganglia (antinicotinic effects).Antimuscarinic activity resides predominantly in the R-isomer. A metabolite, desethyloxybutynin, has pharmacological activity similar to that of oxybutynin in in vitro studies. AbsorptionFollowing the first dose of oxybutynin chloride extended-release tablets, oxybutynin plasma concentrations rise for 4 to 6 hours; thereafter steady concentrations are maintained for up to 24 hours, minimizing fluctuations between peak and trough concentrations associated with oxybutynin.The relative bioavailabilities of R- and S-oxybutynin from oxybutynin chloride extended-release tablets are 156% and 187%, respectively, compared with oxybutynin. The mean pharmacokinetic parameters for R­ and S-oxybutynin are summarized in Table 2. The plasma concentration-time profiles for R- and S-oxybutynin are similar in shape; Figure 1 shows the profile for R-oxybutynin.Table 2: Mean (SD) R- and S-Oxybutynin Pharmacokinetic Parameters Following a Single Dose of Oxybutynin Chloride Extended-Release Tablets 10 mg (n=43)Parameters (units)R-OxybutyninS-OxybutyninCmax (ng/mL)1.0 (0.6)1.8 (1.0)Tmax (h)12.7 (5.4)11.8 (5.3)t1/2 (h)13.2 (6.2)12.4 (6.1)AUC(0-48) (ng•h/mL)18.4 (10.3)34.2 (16.9)AUCinf (ng•h/mL)21.3 (12.2)39.5 (21.2)Figure 1:Mean R-oxybutynin plasma concentrations following a single dose of Oxybutynin Chloride Extended-Release Tablets 10 mg and oxybutynin 5 mg administered every 8 hours (n=23 for each treatment).Steady state oxybutynin plasma concentrations are achieved by Day 3 of repeated oxybutynin chloride extended-release tablets dosing, with no observed drug accumulation or change in oxybutynin and desethyloxybutynin pharmacokinetic parameters.Oxybutynin chloride extended-release tablets steady state pharmacokinetics were studied in 19 children aged 5 to15 years with detrusor overactivity associated with a neurological condition (e.g., spina bifida). The children were on oxybutynin chloride extended-release tablets total daily dose ranging from 5 mg to 20 mg (0.10 mg/kg to 0.77 mg/kg). Sparse sampling technique was used to obtain serum samples. When all available data are normalized to an equivalent of 5 mg per day of oxybutynin chloride extended-release tablets the mean pharmacokinetic parameters derived for R- and S-oxybutynin and R- and S-desethyloxybutynin are summarized in Table 3. The plasma-time concentration profiles for R- and S-oxybutynin are similar in shape; Figure 2 shows the profile for R-oxybutynin when all available data are normalized to an equivalent of 5 mg per day. Table 3: Mean ± SD R- and S-Oxybutynin and R- and S-Desethyloxybutynin Pharmacokinetic Parameters in Children Aged 5 to 15 Following Administration of 5 to 20 mg Oxybutynin Chloride Extended-Release Tablets Once Daily (n=19), All Available Data Normalized to an Equivalent of Oxybutynin Chloride Extended-Release Tablets 5 mg Once Daily ParametersR-OxybutyninS-OxybutyninR- Desethyl oxybutyninS-Desethyl oxybutyninCmax (ng/mL)0.7 ± 0.41.3 ± 0.87.8 ± 3.74.2 ± 2.3Tmax (h)5.05.05.05.0AUC (ng•h/mL)12.8 ± 7.023.7 ± 14.4125.1 ± 66.773.6 ± 47.7Figure 2: Mean steady state (± SD) R-oxybutynin plasma concentrations following administration of 5 to 20 mg Oxybutynin Chloride Extended-Release Tablets once daily in children aged 5 to 15. Plot represents all available data normalized to an equivalent of Oxybutynin Chloride Extended-Release Tablets 5 mg once daily.Food EffectsThe rate and extent of absorption and metabolism of oxybutynin are similar under fed and fasted conditions.DistributionOxybutynin is widely distributed in body tissues following systemic absorption. The volume of distribution is 193 L after intravenous administration of 5 mg oxybutynin chloride. Both enantiomers of oxybutynin are highly bound (greater than 99%) to plasma proteins. Both enantiomers of N-desethyloxybutynin are also highly bound (greater than 97%) to plasma proteins. The major binding protein is alpha-1 acid glycoprotein.MetabolismOxybutynin is metabolized primarily by the cytochrome P450 enzyme systems, particularly CYP3A4 found mostly in the liver and gut wall. Its metabolic products include phenylcyclohexylglycolic acid, which is pharmacologically inactive, and desethyloxybutynin, which is pharmacologically active. Following oxybutynin chloride extended-release tablets administration, plasma concentrations of R- and S-desethyloxybutynin are 73% and 92%, respectively, of concentrations observed with oxybutynin.ExcretionOxybutynin is extensively metabolized by the liver, with less than 0.1% of the administered dose excreted unchanged in the urine. Also, less than 0.1% of the administered dose is excreted as the metabolite desethyloxybutynin.Dose ProportionalityPharmacokinetic parameters of oxybutynin and desethyloxybutynin (Cmax and AUC) following administration of 5 mg - 20 mg of oxybutynin chloride extended-release tablets are dose proportional.Use in Specific PopulationsPediatricThe pharmacokinetics of oxybutynin chloride extended-release tablets were evaluated in 19 children aged 5-15 years with detrusor overactivity associated with a neurological condition (e.g., spina bifida). The pharmacokinetics of oxybutynin chloride extended-release tablets in these pediatric patients were consistent with those reported for adults (see Tables 2 and 3, and Figures 1 and 2 above).GenderThere are no significant differences in the pharmacokinetics of oxybutynin in healthy male and female volunteers following administration of oxybutynin chloride extended-release tablets.RaceAvailable data suggest that there are no significant differences in the pharmacokinetics of oxybutynin based on race in healthy volunteers following administration of oxybutynin chloride extended-release tablets. A 24-month study in rats at dosages of oxybutynin chloride of 20 mg/kg/day, 80 mg/kg/day, and 160 mg/kg/day showed no evidence of carcinogenicity. These doses are approximately 6, 25, and 50 times the maximum human exposure, based on a human equivalent dose taking into account normalization of body surface area.Oxybutynin chloride showed no increase of mutagenic activity when tested in Schizosaccharomyces pompholiciformis, Saccharomyces cerevisiae, and Salmonella typhimurium test systems.Reproduction studies with oxybutynin chloride in the mouse, rat, hamster, and rabbit showed no evidence of impaired fertility. Oxybutynin chloride extended-release tablets, USP are available in three dosage strengths, 5 mg (light yellow to yellow), 10 mg (light pink to pink), and 15 mg (light grey to grey) and are imprinted on one side with "0B1", "0B2", or "0B3" with black ink. Oxybutynin chloride extended-release tablets, USP are supplied in bottles of 100 tablets and 500 tablets. 5 mg100 count bottle with child resistant closuresNDC 27241-155-04500 count bottleNDC 27241-155-0810 mg100 count bottle with child resistant closuresNDC 27241-156-04500 count bottleNDC 27241-156-0815 mg100 count bottle with child resistant closuresNDC 27241-157-04500 count bottleNDC 27241-157-08StorageStore at 20°C to 25°C (68°F to 77°F); excursions permitted to 15°C to 30°C (59°F to 86°F). [see USP Controlled Room Temperature]. Protect from moisture and humidity.Keep out of reach of children.